Jazeman Jaafar is just days away from the start of the Le Mans 24 Hours race and the build up to this historic race has begun. He took time out of his busy diary to chat about the challenge ahead. You had your first experience of the Le Mans track at the official test session last week, what did you think about it? It felt very special to be there and after watching the race on television since a child and the first few laps gave me goosebumps, to actually be driving on it. It’s an awesome track, I’ve never driven anything like it before. I think it was the number of high speed corners that surprised me most, as seeing it on TV doesn’t do justice to that. The track has about 70% high speed corners which suits me as I like this type of corner. Loads of them are blind and challenging so it takes a while to get to grips and up to speed with them. It was a very special experience to have my first drive of the circuit. What are the challenges presented by the Le Mans track? I think it’s the mental challenge as well as a physical one that sets this track apart from others, as it is such a long lap. To nail a perfect lap is very difficult. Every one of the five sectors has to be absolutely spot on to get the optimum lap time. But it’s not just about getting the perfect lap, as you also have to plan traffic management, knowing where faster, LMP1, cars are around you and overtaking the slower cars. The competition in LMP2 is very, very strong and I can see the top 15 being as close as within one second or two, so we can’t afford any mistakes at all. Also managing the pressure and intensity throughout the 24 Hours will be very important. How will this race differ from other 24 Hour races you’ve competed in? I think the race itself, with the incredible fanbase and spectator attendance lifts the whole event to another level and that definitely impacts on how you feel, the excitement and adrenalin levels will certainly be higher. I’ll be aiming to treat it the same as any other, with the best preparation of fitness and diet, plenty of sleep and the rest will come naturally like any other race. What does it mean to be racing with Malaysian teammates? It’s very special to be racing in an all-Malaysian car, there’s never been a car at Le Mans with all three drivers Malaysian, so it’s pretty historic for Malaysian motorsport. We may be seen as underdogs, particularly as we are all rookies, but we have already proved with our fourth place finish at Spa (and promotion to a podium third place) that we’re not out there just making up the numbers. Flying the flag for Malaysia is very special. Coming from Asian Le Mans Series and achieving on merit an invitation to Le Mans makes it even more impressive and I believe it has opened people’s eyes to what we can achieve and puts us on a world stage at the top level of sportscar racing. For me, it is to be World Champion, but for this race, the first goal will be to reach the chequered flag as that is a major feat in itself. Everything has to come together – team, drivers, car – to achieve that. If we can achieve this without any technical problems or driving incidents, we’ll be looking strong for a top five finish. Of course if we can be on the podium it would be fantastic, but I think we have to be realistic and aware that we don’t have as much experience as others and there is lots to learn. How will you cope with the weather when you are in the cockpit? We’re expecting a whole week of changeable weather, so it’s difficult to plan, especially as the test was run in hot, dry conditions. It’s likely that it will be a wet race, not necessarily the whole time, but across the 24 hours, we can expect some rain. As we haven’t experienced this yet, I don’t know the grip levels, spray levels, visibility, it’ll all be new and uncharted territory. Intermittent showers are very difficult for Le Mans as the lap is so long. So if you’re on the wrong tyre at the start of the lap, it’s a long way back to the pits. With the track covering such a distance you also find the track can be wet in parts and dry in others, so again it can be very tricky If we get some wet running in the practice sessions we’ll have a better idea of what’s in store. What is your favourite section of the track? Indianapolis. I like the combination of coming from 300 kph, peep down a gear, carrying the speed into the right then braking for the left, the timing has to be perfect. When you get it right its very rewarding. The most challenging corner is Porsche Curves. It has a blind entry, is very bumpy but super high speed and so to get it perfect isn’t easy. How do you prepare for a race like Le Mans? Already I’m taking a lot of fluids on board, eating well and ensuring that I have a regular sleeping pattern, as well as focusing on my training regime. It’s really no different than any other race, as you always want to be at peak performance. How does Le Mans differ from your usual World Endurance Championship races? Most of the races are six hours, across three drivers, and they feel like a sprint race, while for a 24 hour distance, you need to manage tyres and fuels, so it’s more of a marathon. But then again, the competition is so high, you need to have perfection and so you need to have the pace of a qualifying lap every lap, keeping error free, it’s a fine line to cope with all the demands on you and the team. How do you get on with your teammates? We’ve been training together and spending a lot of time together, travelling and preparing, so it’s good to be bonding closely ahead of the race and as three Malaysians representing our country as well as our team, we are all very supportive of each other. We all need to put in maximum effort to achieve success and working closely together is the way to achieve this. Le Mans 24 Hours has to be the highlight for any sportscar driver. There is no other race like it and with it’s week long build-up, there’s an incomparable festival feeling with a fantastic atmosphere which just gets more highly charged as you count down to the start. Having the honour of driving with Jackie Chan DC Racing, sharing it will fellow Malaysians, feels amazing. 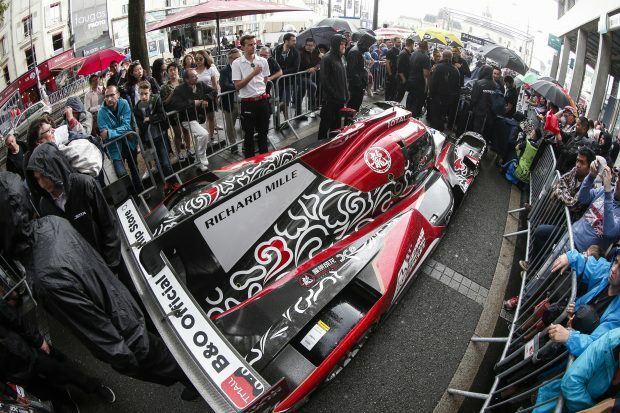 The 86th running of the 24 Hours of Le Mans starts at 3pm on Saturday 16 June, local time.